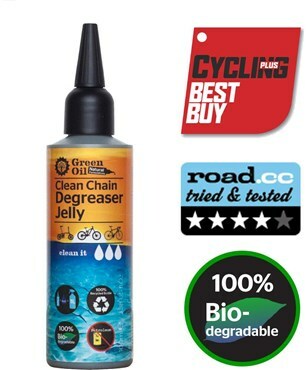 Green Oil Clean Chain is a revolutionary, powerful degreasing gel. Apply Clean Chain like a lubricant, and ride around for a couple of minutes. Run your chain through a dry rag, and then a wet rag or brush. Finally rinse the chain thoroughly with water, for a clean chain. Clean Chain is totally biodegradable, and safe for you and aquatic life. A 100 ml bottle of Clean Chain can also be mixed with 900ml of water to make a whole 1 litre bottle of Green Clean bike cleaner. Clean Chain contains no petrochemicals and is made from 100% naturally derived ingredients, using the power of citrus extracts and coconut oil. Seriously good degreaser. I didn't think it would be so potent and put a few more than 2-3 drops on my chain and had to spend time just removing the sheer suds it produced. Very easy to degrease with a few mins and a rag.